Keep your dog out of the elements by building him a wood dog house. Most of these dog house plans can be built in a weekend. 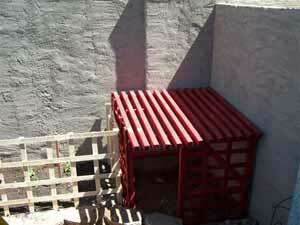 Here is a simple to make open air dog house that is designed to fit into a shaded corner. You can easily give your dog an area to stay comfortable and cool just by following these easy steps along with a video. Great for locations that experience hot summer days. 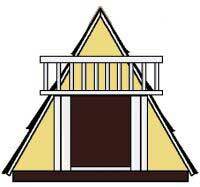 Here is a standard A-frame dog house that is very easy to build using this plan. What makes this dog house stand out from the rest is the balcony over the entry. 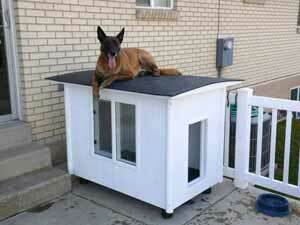 Even though your dog probably won’t be using the attached balcony it certainly makes this dog house a one of a kind. This dog house is built on coasters which makes it easy to move from place to place. It also is designed to knock down easily when needed for ease of shipping or storing away. Plan has easy to follow instructions and a complete list of needed materials to get the job done. 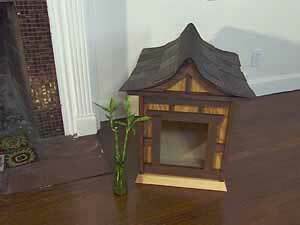 You can build a dog house in Asian styling using this detailed project. This dog house is for a small dog and is made primarily out of plywood with a tiled roof. Step by step instructions with illustrative pictures makes this a dog house you can have completed in a single day. 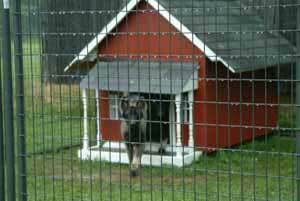 Large dog house that has a covered porch and two front windows. Once built this dog house has lots of room for most any large sized dog. With its double pitched and tiled roof plus solid wood frame construction here is a dog house that will last a very long time.